Yesterday I was at the North Carolina Arboretum in Asheville, and set myself the job of taking photos of lines. All but the bottom row of photos were taken there. It is a marvelous place that boasts not only gorgeous plants, but beautiful architecture, spectacular decks and fences, and great sculpture. I particularly like the shots where the lines frame negative space that changes (for example, the fence shots with blue sky in some spots, clouds in some spots, and grass or trees in some spots). It is interesting to note that none of the line photos I took at the Arboretum are plants or natural materials. 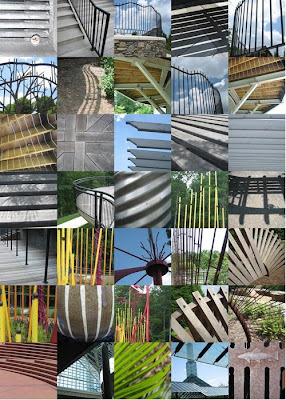 I guess I was looking for primarily straight lines, and the structures of the man-made things are mostly straight.